Looking for private in-home or in-studio Clarinet lessons? Our La Crosse teachers are ready to get you started. Find your teacher today! Check out some of our most popular teachers near La Crosse, FL including Gainesville, Jacksonville, Orange Park, Middleburg and Fleming Island. Although I am primarily a saxophonist, clarinet is a secondary instrument that most saxophonists also have to know how to play. As a performer it is an absolute necessity that I be able to double on the clarinet and be just as proficient. My goal as a teacher is to provide an in depth understanding of the instrument to my students. Whether we are learning technique specific to the instrument or general musical concepts, it is important to me that I take the time to insure that my students not only learn how to do something, but also the reasons why we are learning a specific concept or technique. At the end of the day, my ultimate goal is to teach you how to teach yourself, so that you may enjoy playing the instrument outside of our lessons together. Thanks for choosing me as you private music instructor. I’ve enjoyed teaching music since 2001 and being a Takelessons teacher since 2008. I specialize in teaching beginner to advanced saxophone, beginner to intermediate clarinet, beginner flute, and beginner to advanced jazz improvisation. I welcome all ages and believe that it is never too late to pick up an instrument, even if you’ve had no prior experience in music. Specifically when it comes to beginners, I am able to provide virtually everything that you need to get started, including access to brand new and lightly used student model instruments that I have for sale at very reasonable prices. ty after moving here from Philadelphia in early 2001, after graduating from the University of the Arts in Philadelphia in 1999 with a Bachelors in Music Performance. Throughout my musical career I have worked in a variety of capacities in addition to being a performer, including working as a composer and recording studio engineer. My main area of expertise is performing as a jazz saxophonist on alto, tenor, and soprano saxophones, and I regularly play throughout New York City in restaurants, jazz clubs, bars and other music venues. As a private music teacher, I place an emphasis on giving the student an in depth understanding of his or her instrument, and I place the utmost importance on explaining advanced concepts in the simplest of terms in order to insure that the student fully comprehends the objectives of each lesson. Such concepts that I cover regularly are sight-reading, ear-training, technique, and creativity. As a regularly performing musician in New York City, I can be seen every Sunday night at Ba'sik (a very popular bar in Williamsburg Brooklyn) where I lead an open jazz jam session. A few of my adult students have even been able to reach a level in jazz improvisation that they've been able to come out and sit in with the band. YOUNGER STUDENTS: I’ve found that in most cases, it is very difficult for students younger than 8 or 9 years old to learn instruments like the clarinet, saxophone and flute. Occasionally, an exception can be made if a younger student is taller than average for his or her age, but most of the time the size of a student’s hands, as well as his or her amount of a physical strength, are not adequate enough until around the ages of 8 or 9. 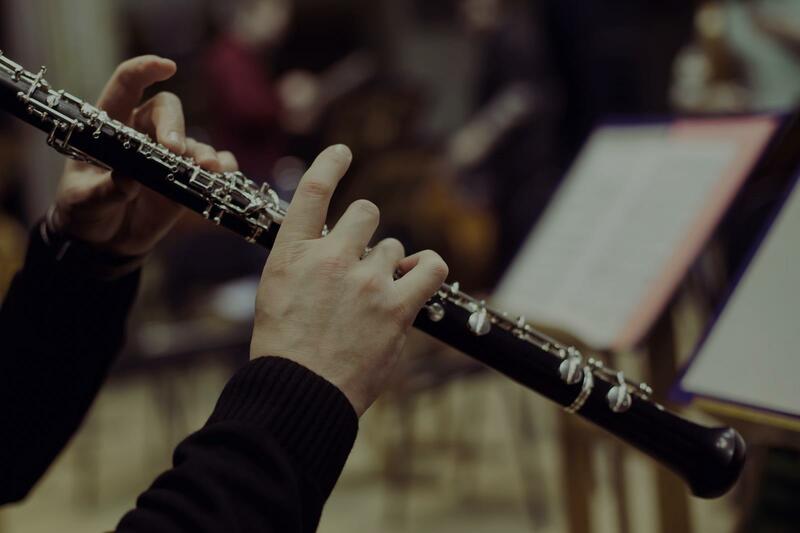 A worthwhile alternative, if a student is absolutely enthusiastic about learning a woodwind instrument, is to begin them on an instrument called the recorder. The recorder is a real instrument, but it is a more primitive, smaller, and simpler of an instrument than the saxophone, clarinet, or the flute; however, it is a great way for young students to begin learning the basics of playing a woodwind instrument and also learning important musical concepts such as reading music notation, pitch, and rhythm. I have also been introduced to a new line of instruments that are developed for younger students by a company called Nuvo. These instruments are smaller and simpler analogs to the saxophone, flute, and clarinet, and they can function as the next step in a younger student’s progression between the recorder and an actual saxophone, flute, or clarinet. The specific instruments that I deal with are called the jSax and the DooD by Nuvo Instrumental. I was asked to demo these instruments and you can check them out if you scroll down to the video section of my profile and look for the videos entitled “jSax and DooD review and demo. Nuvo Instrumental” or “jSax and Dood demo. Nuvo Instrumental”. In addition to teaching woodwind instruments and jazz improvisation, I also have experience teaching Sibelius music writing software, and audio engineering and editing with Pro-tools LE and Logic Pro X. PLEASE NOTE: Because the NYC area is very different geographically from other parts of the country, especially in terms of transportation, I may appear outside of your area in terms of where I am available to travel. If you are very interested in taking lessons with me, but you are outside of my travel zone, please feel free to follow up with a Takelessons counselor and have them contact me personally to see if we might make an exception. I am available to travel to virtually all areas of Queens, Brooklyn, and Manhattan as well as Jersey City and Hoboken, depending on if the day and time selected allows me acceptable travel time between other scheduled lessons. If my location in Astoria Queens is not convenient for you, and you are unable to have lessons in your home, then there is also an option where I can most likely find a very affordable teaching studio in an area that is more convenient for you that we may rent by the hour and split the cost for your lesson. Any student, regardless of age or experience level, learns best when engaged in an activity that he or she understands and enjoys. Part of my success as a teacher can be attributed to my willingness to take into account every student's particular musical interests and strengths, and attempt to teach directly to those areas. For instance, in the initial stages of developing a student and teacher relationship, I like to request that the student compile a "wish list" of approximately ten pieces of music that he or she would like to be able to play. This list may include pieces in such genres as classical, jazz, and popular music, just to name a few. It is through this list that the student can begin almost immediately learning exactly what he or she likes, and by default, I can then teach the student all of the technical components needed to perform on his or her instrument, as well as determine the specific areas where the student needs to receive more focused instruction. More importantly, this "thinking outside of the box," customized approach provides a fun atmosphere and enables the student to enjoy learning the art of playing music by not being solely dependent on instructional booklets which many students, regardless of age and experience, find boring and tedious. Additional saxophones for students who do not currently have a saxophone to use during a lesson. Recording equipment, including software and microphones. Mac book pro with music writing and recording software. Full 88 key keyboard. Very knowledgeable and easy going. My son had a good rapport with Matt and I sensed he was very comfortable with him. Through the foundation I've gained by the influences of Mel Bay, Hal Leonard, and Suzuki musical instruction methods, I compile my own teaching materials. Using personally constructed guitar lessons, I demonstrate, instruct, and guide the student based on my assessment of their individual needs, skill level, and progress. Lessons are formulated in Modules, and advancement through them is based on the student's personal aptitude, skill level, and practice commitment. Learning is accomplished by ear as well as through essential methods of musical notation (tablature, 5-line staff, rhythmic comprehension). Students are trained to perform written music as well as to write and express the music within themselves. I'm an encouraging and motivating guitar teacher with a casual relaxed approach. Teaching new guitarists is very rewarding to me. To see the light come on and watch a student perform a song, express themselves musically, and create their own composition is an awesome experience. The key to learning guitar......is finding the right instructor! I am an encouraging, effective guitar instructor and an experienced performing musician, offering in-person beginner through intermediate guitar instruction in my home and on line. It is very rewarding to me to help others along the journey of creative expression through music. To see the light come on and watch a student perform a song, express themselves musically, and create their own composition is an awesome experience. To kick back after a long day and let your soul speak through a musical instrument is a wonderful release. Please let me guide you along this incredible adventure to bring out that inner artist! s of reading tablature and 5 line staff, and great popular songs. You'll be playing your favorite tunes in no time! Through formal and self- instructed lessons from age 12, I've learned country, folk, blues, rock, and metal techniques and formed several local bands as lead vocalist and lead/rhythm guitarist. Writing and recording my own music has been a hobby for over 30 years. An active music enthusiast from a young age, I began with clarinet technique and music theory from age 9 through public schools, performing in orchestra and marching band. I'm enjoying my lessons with Scott. He has taught me a lot. He makes playing and learning exciting. I can't wait for my next lesson. I started with Scott as a newbie and he has definitely helped me grow as a guitarist. He takes time and makes things easier to learn. As complicated learning can be, he simplifies it and breaks it down. When I feel like I’m not progressing he always shows me how I am. His modules are easy to follow. His teaching style is compatible with all types of learners whether you are visual, hands on or a listener. It’s not just business with him. He’s always available for questions after or between lessons. He’s knowledgeable in equipment so don’t hesitate to ask for some advice on what to buy. He’s affordable and lesson times are flexible. I highly recommend him for all ages and learning needs. Scott has been a great help to me, filling in the gaps and teaching exactly what I request: techniques, specific songs, and lesson times at work for me. He communicates well and follows up after each lesson with emails. Patrick is a New York-based clarinetist and educator. Patrick has maintained private studios in Florida, Ohio, Indiana, and New York. His students have received top honors at Solo & Ensemble evaluations and have participated in various honor bands. Additionally, he regularly works with high school band programs where he teaches sectionals and group classes. mpetition. In addition to solo and chamber music performances, Patrick is an ardent orchestral performer. He has appeared with groups such as the Richmond (IN) Symphony, the Kentucky Symphony, the Brooklyn Wind Symphony, and the New York Pops. He also spent the summer of 2018 in the orchestra for Leonard's Bernstein's Peter Pan as a part of the Bard College Summerscape series. I welcome students of all ages ability levels! I have taught students from age 10 to 64, from beginners to advanced players. Can't find a teacher in La Crosse, FL?